Sail off into the sunset on an exotic luxury cruise ship. This will probably be the experience of a lifetime. Days and nights at sea, fabulous meals, casinos and swimming pools on deck, this is the holiday you planned and dreamed of. Capture those amazing feelings and give them to your clients when you brand these delightful cruise ships with your logo and graphics and hand them out as give-aways. They are ideal for up-market advertising campaigns and the fact that they are also stress toys makes them even more meaningful. Stress toys are great for general health. They offer a convenient way to release built up tension when you cannot get to the gym or out for a run. They also keep your hands in great shape as you flex your finger and hand muscles and get a great work out. 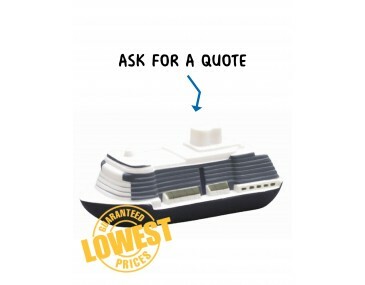 The design is crafted in a three-dimensional shape of a stylish cruise ship. It has numerous levels of decks and huge funnels on top. The dark hull contrasts neatly with the light colour or the body. You brand logo will look stunning on the ship. Companies in the luxury cruise-line travel business will create a real buzz when you give these stress toys to your clients. The branding process is simple and fast, we offer a product turnaround time of two weeks, but we can offer even faster turnaround times for urgent orders. Our listed price includes branding of your logo or graphic in a single colour print onto the car. This product stocked and branded in Australia and is available for delivery within Australia only.